Moon Resources Corp. wants to offer you a job on the moon... but mining for resources can be dangerous with its harsh landscape, hostile wildlife, raiders, and the occasional ancient alien technology. Fortunately, you're well armed for the task with access to a machine gun, shotgun, flamethrower, rocket launcher, and minigun, each of which can be upgraded and loaded with specialized ammo types that allow them to pierce armor, burn enemies, or explode on contact. 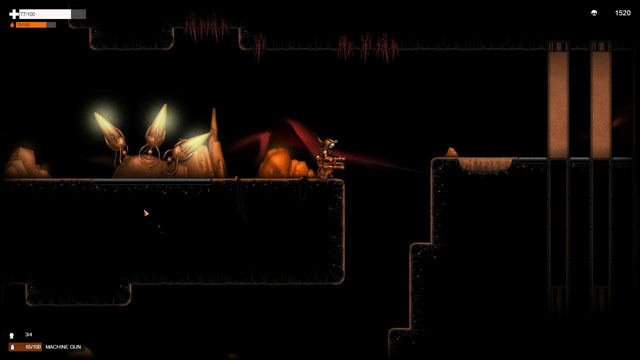 In Orange Moon, from Betelgeuse Zero, players move through a dangerous underground world, exploring the environment, defeating enemies and bosses, and gathering resources to upgrade their firepower and other abilities, including their grenades and jetpack-assisted jump.